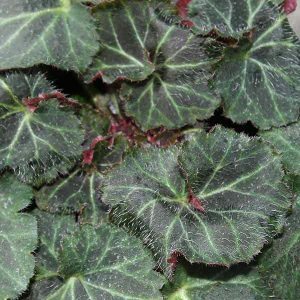 Gardeners love shade loving ground cover plants and Saxifraga stolonifera, with great foliage and attractive flowers in spring is one to consider. With a few common names Saxifraga stolonifera is sometimes called Aarons Beard or Roving Soldier, Strawberry Begonia and sometimes Mother of Thousands. Best described as an evergreen ground cover plant, it is native to Japan. The plant is also known as the Strawberry Begonia, although it is not related to either. It is versatile and can also be grown as an indoor plant in colder climates. With rounded green leaves, patterned with silvery veins, dainty white flowers rise above the foliage in summer. The underside of the petals are a maroon colour, and different cultivars display varying leaf characteristics. Very useful in the garden as a ground cover plant for part shade, also useful for underplanting taller trees and shrubs grown in containers. Saxifraga stolonifera is very easy care in the right conditions, it requires a moist well drained soil, preferably rich in organic matter. Growth can be assisted by digging in well rotted compost and some coir peat before planting. In long dry periods, some extra water will be appreciated, although we have found the plant to be remarkably drought tolerant in a shed position in good soil. This is a plant that will slowly spread by underground stolens, it will form a good clump over time, however is easily kept in its selected position. Propagation is easy by division of established clumps in early spring. Common Names – Aarons Beard, Strawberry Begonia, Roving Soldier, or Mother of Thousands. Height – Will reach 60 cm when in flower. Spread – Will form a clump to nearly 1 m over time. Foliage – Green with silvery veins and covered with fine hairs, foliage is backed in maroon.